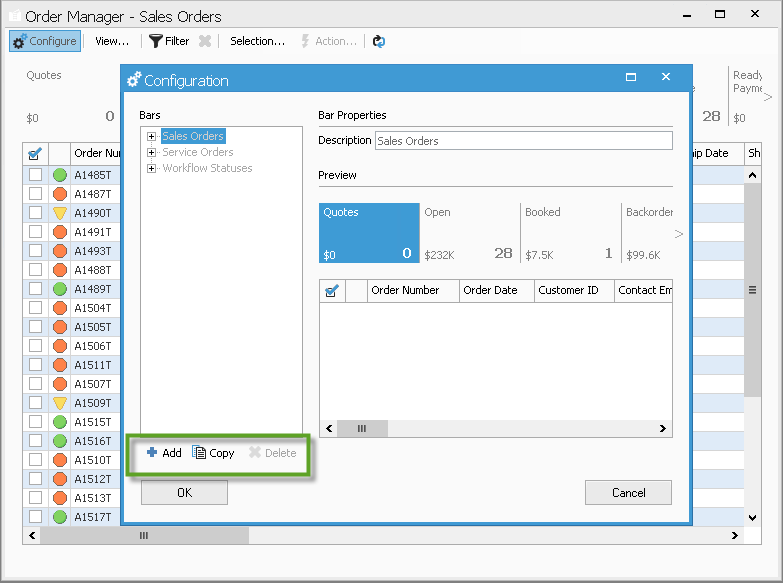 Included in the Sales Order Manager are some standard views of open Sales and Service Orders. We recognize our users may want to create a custom view of Orders for their unique needs. In the Order Manager, select the “Configure…” button on the toolbar. The Configuration window will open. The Configuration window is split between the Bars tree and a preview of each bar and button. You will notice the first three bars are greyed out. These bars are default views of your open Sales and Service Orders and cannot be modified. In the Bars section, you can select to either add a new bar or copy an existing bar. Typically, users will copy an existing bar and modify the selections according to their own needs. When creating a new bar, you will be prompted to name this bar. If you select to copy an existing bar, you will find the buttons from the copied bar will now exist in the tree for your new bar. Here, you can select each button and modify the selection by adding or modifying the selection criteria. If you select to create a new bar, the first button will be added for you. You will need to name the button and then add the selection criteria for that specific button. In the Amount field, you can select which amount you would like to have summarized and displayed on the button. You can continue adding buttons to your custom Bar by clicking the [Add] button at the bottom of the Configuration window. Next, you will want to add or modify the selection parameters for this specific button. By default, your button will include Sales Orders that are scheduled or backordered. 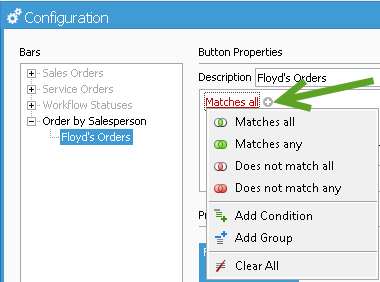 To add additional parameters, select the plus sign next to the red “Matches All” in the selection parameters box. A new parameter line will be added at the bottom in which you can modify. Each section of the parameter is clickable and editable. Start by clicking on the blue field name to select the field you want to filter on. Then, click on the green “Is” section to change how you want to filter the selections, then, enter in or select the values you want to filter on. Once you are finished with adding and/or modifying your selections, select the [OK] button, which will close the Configuration window. To view your new bar, select the [View…] button at the top of the Order Manager and click on your new custom view.